(New York, NY) OK Go, the mind-bending band that gave us what is largely considered the decade’s most-viewed music video, the treadmill-manned “Here It Goes Again,” will join with Design Miami/, FENDI and technologically-pioneering designer Moritz Waldemeyer to stage a groundbreaking Design Performance at Design Miami/, the pre-eminent international fair for limited edition design. The fair will take place December 1st through December 5th in Miami Design District. Waldemeyer, renowned for his extraordinary designs influenced by his background as a research scientist in mechatronics and LED lighting, will customize a selection of Gibson guitars with laser lights and FENDI materials, which OK Go will play live throughout the event. When played, the guitar’s lasers interact with a video wall and leave traces that illustrate the music in real time. The lasers emulate the strings of the guitar, and vibrations transmit beautiful visual interpretations of the sound. Produced by ex-Mercury Rev member David Fridmann (Flaming Lips, MGMT), Of The Blue Colour Of The Sky takes its name from an 1876 book promoting the erroneous theory that blue light cures all ills. Both danceable and contemplative, the new album is introspective with a vein of surrealism running through it – a compelling follow-up to OK Go’s acclaimed 2005 release, Oh No. The band’s homemade videos for two of Oh No’s hits, “A Million Ways” and “Here It Goes Again,” set numerous viewing records as they helped transform the then-fledgling YouTube into a household name. “Here It Goes Again,” which won a GRAMMY® award for “Best Short Form Music Video” in 2007, was even parodied on “The Simpsons.” The band’s non-stop touring regimen took them to five continents in 31 consecutive months. In 2008, OK Go released the EP You’re not Alone, a swaggering collaboration with the trombone band Bonerama that benefited musicians displaced by Hurricane Katrina. The band wraps up a series of Midwestern dates this Saturday and will embark on a U.K. tour in January. 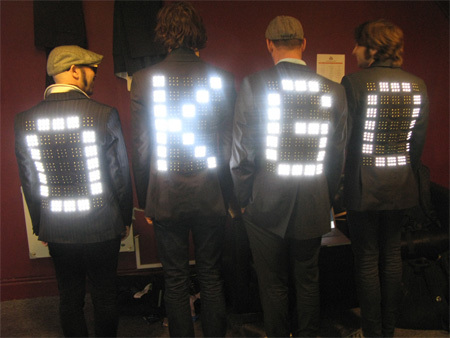 OK Go is Damian Kulash, Tim Nordwind, Dan Konopka, Andy Ross.